The Tennessee Valley Authority Bluegrass Band helps kick off the 10th season of the Roots Music concerts at the Pioneer Museum in Fredericksburg on May 28. They will be joined by Sugar Bayou and The Saltgrass Band for an evening of bluegrass and newgrass music. Information at www.pioneermuseum.net. Starting May 28, the Pioneer Museum will celebrate its 10th year of the Roots Music Series in the Texas Hill Country, with five all-new summer concerts plus a bonus “Indoor Encore” in the Historic Sanctuary in October. These live, open-air eclectic Roots music concerts on the grounds of the Pioneer Museum in downtown Fredericksburg, Texas, feature emerging and established artists in an informal, family setting. The May 28 concert will highlight a Bluegrass/Newgrass theme, with performers Tennessee Valley Authority, Sugar Bayou, and The SaltGrass Band. For over 35 years, founder Hank Harrison has kept Tennessee Valley Authority Bluegrass Band churning out bluegrass music in Central Texas. The band has won numerous awards including the National Bluegrass Band Championship in Louisville, Kentucky, and has performed with Bill Monroe, Johnny Gimble, Flaco Jimenez and Junior Brown. 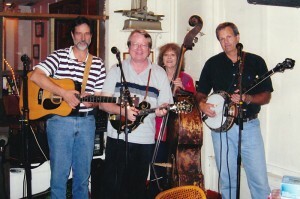 They are a popular headliner at bluegrass and acoustic music festivals throughout the country. The five members of Sugar Bayou write and play eclectic acoustic music – folk, swingy bluesy jazz, Celtic, bluegrass, Cajun, South American, and a touch of Texas rockin’ country. The Saltgrass Band has performed their deep roots, traditional bluegrass sound through the South for three decades. Keeping the sound fresh, the experienced 5-piece group has added contemporary bluegrass as well as bluegrass gospel, so there is something for every bluegrass listener. All concerts take place on Saturdays 6 – 10 p.m., with gates open at 5 p.m. Guests can purchase a meal and refreshments of wine, beer, sodas, and water. Parking is free. The Pioneer Museum is located at 325 West Main Street in Fredericksburg, with event entrance on Milam Street.